Dad of Five and I enjoyed a rare couple for days away in London to celebrate our 10th wedding anniversary. 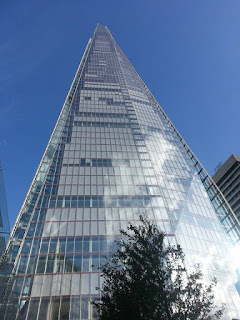 We were lucky enough to go and enjoy the amazing views from The Shard and I took this quick snap as we left. Such a glorious day and lovely views. Happy anniversary, I haven't been back to London since they built this, but love the look of the building, what's the view like? The Shard really is an incredible building isn't it? And against the stunning blue sky it's just beautiful. i could stare at this building for hours. we went up it just before it opened to the public such incredible views. fabulous shot. one day i will have to come over to london again and check it out in person.